Business phone systems for financial services. Financial services cover a wide variety of business endeavors, from large brokerage firms to small accounting offices. However, no matter how big or small your financial services company is, at the end of day you need to find the best way to crunch the numbers for your customers. Efficient communication through every step of the process is a must. What do financial services need in an office phone system? Having a professional image is one of the most important goals of any financial service. After all, your customers are trusting you with their income, taxes and investments. It’s critical to make a good first impression – chaotic or disorganized communication is definitely not a good way to put your best foot forward in this industry. Accountants, payroll professionals, investors, brokers and bankers can all benefit from an office phone system like Ooma. When you are discussing important business deals like contracts, tax deductions and investments, the last thing you want to worry about is an inefficient or faulty business line. People who work in financial services might also spend a lot of time traveling to discuss contracts and might have to talk to international clients. With this type of work, mobile access to a business line and low-cost international dialing are a must. Find out more about how Jane and Cape Coral Bookkeeping & Payroll use Ooma Office to take advantage of business opportunities and save money. Ooma Office does everything it promises to do, and then some. As a small business in my area, Im always recommending that they replace their traditional phone lines with Ooma Office. They never regret it. Virtual receptionist: Set business hours and afterhours settings, greet clients, and direct calls – this is the best way to keep your company looking professional, and it helps you stay organized. Extension dialing: Have customers dial directly to their financial advisor, accountant or broker with this feature. Free toll-free or local number: Create a more established business presence by choosing a free local or toll-free number. 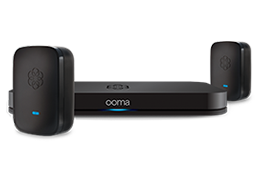 This is included with every Ooma account, and we can even port over your existing business number. Use your smartphone: Great for financial advisors on the go, the Ooma Office Mobile App allows you to take calls from your business line on your smartphone. This helps you stay mobile and ensures you’ll never miss a client’s call. All-inclusive price: Every Ooma account comes with a local and toll-free number of your choice, a virtual fax extension and a conference extension line. To find out how Ooma can help your financial services company, check out our business phone system page to learn more about our features and benefits. To see what kinds of features Ooma can offer to help you boost your financial services business, watch the video below.